The 52nd annual Big Rock Blue Marlin Tournament ended on June 19th with an interesting twist. In first place on the leader board all week and a shoe-in to take the top prize with a record breaking 883 pound blue marlin; the Citation with Capt. Eric Holmes was disqualified due to one crew member aboard the vessel that did not have a N.C. Recreation Fishing License..
Big rock President Randy Ramsey was just moments away from awarding the top three prizes when he decided to stop the Big Rock awards ceremony. 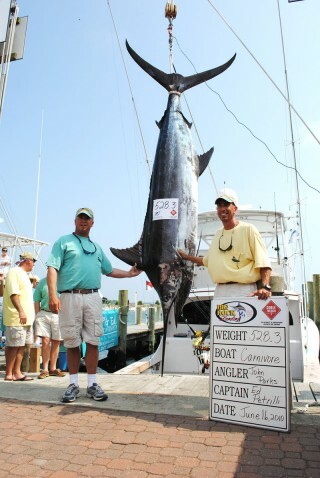 Spending most of the past week in second place on the leader board with 528.3 pound marlin, the Carnivore with Capt. Ed Petrilli was declared the first place winner of the tournament..
Capt. Petrilli and the crew of the Carnivore accepted both the first place price and the tournament’s prize payout, a new big rock record totaling $999,453.